Arsenal’s transfer plans may have taken a bit of a hit after Monchi’s return to Sevilla was announced after his departure as sporting director at Roma. The Guardian reported yesterday that it looked like the Gunners were set to miss out on Monchi, and that has proven to be the case. It remains to be seen if Monchi’s transfer targets will remain the same at Sevilla, or if he’ll have to switch focus to more affordable players and slightly less big names. That said, even if Sevilla are not a direct rival for some of the players Arsenal had been linked with, they may now lack that top negotiator to help them see off other competitors for their signatures this summer. ¡Bienvenido a casa, @leonsfdo! ? 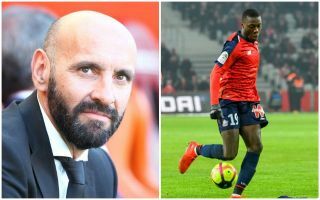 An exciting winger/forward tearing it up with Lille this season, Nicolas Pepe was recently linked with Arsenal with the approval of Monchi by football.london. The Ivory Coast international is sure to have a long list of suitors this summer, so the north London giants may now be up against it in terms of bringing him to the Emirates Stadium. With upgrades surely needed on players like Henrikh Mkhitaryan and Alex Iwobi, this is a big potential blow for Arsenal – unless they can bring in someone of a similar calibre to do their recruitment. It was recently reported by Sport that Arsenal were rivalling Manchester City for the signing of in-form Benfica left-back Alejandro Grimaldo and could gain an edge in the deal with Monchi’s help. Well, they can’t count on that any more, so this could be another big blow for the Gunners in their bid to strengthen an important part of their squad. Sead Kolasinac has blown hot and cold at the Emirates, while Nacho Monreal is not getting any younger, with Grimaldo an ideal upgrade if they can still somehow get him in against strong competition. A player Monchi knows well, having raided Sevilla to bring him to Roma, with Calciomercato recently claiming he’d be a target of his at Arsenal too. The Frenchman was immense in his time in Spain, less so in Italy, and seems an ideal fit for what Arsenal are looking for in midfield. However, could a reunion with Monchi in Sevilla again now be the most likely destination for him?